Flame slot has 5 reels, over 3 rows and 20 paylines and was built by developer NextGen. 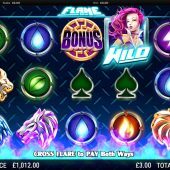 As the name suggest the game is based on flames and includes 7 mini-features that are randomly triggered and provides win both ways, cash rewards, Wild multipliers up to 10x for high value symbols, expanding Wilds with re-spins and transforming Wilds. The main bonus feature in Flame slot offers Free Games feature, with 30 free spins achievable and the mini-features occurring more frequently. This game's Theoretical return to player (RTP) is 96.61% and it would be considered medium volatility. Flame slot is well designed and offers a variety of entertainment – with its 7 mini-features in the base game and also the free games bonus. There is a chance of winning 1,213x your stake on a single spins, which makes things quite exciting. If you like this theme then you may also want to check out Flame Busters or Flame Dancer. Both of which are very good games in their own right.